A Venture Capital Partnership for Google Glass Apps « Adafruit Industries – Makers, hackers, artists, designers and engineers! A Venture Capital Partnership for Google Glass Apps @ NYTimes.com. Three prominent venture capital funds want software developers to know they are on the hunt for apps and software for Google Glass, the company’sInternet-connected glasses. On Wednesday, Google Ventures, Kleiner Perkins Caufield & Byers and Andreessen Horowitz announced the Glass Collective, an investment partnership. The three firms said they had agreed to share every pitch from start-ups related to Glass, so each firm would have the chance to invest. 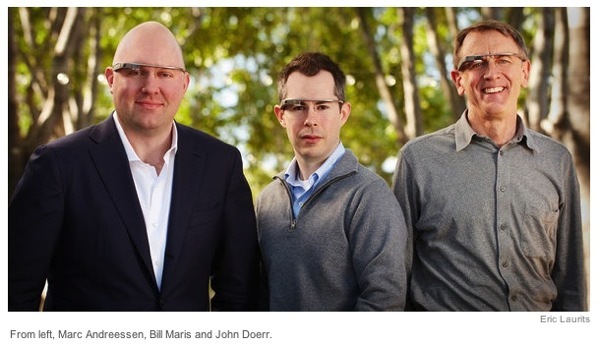 Looking forward to more diversity within/around Google Glass.